Amaretto Amaretto Mixed Berry Deep Dish Slab Pie Deep Dish Slab Pie is the perfect dessert recipe for your Thanksgiving spreads! I don't get fancy when it comes to desserts for the holidays. I'd much rather cook savory over bake sweet, and I'm not necessarily sad about this. If I'm actually hosting Thanksgiving or another holiday, I usually ask my guests to bring the desserts. I'd much rather be roasting the turkey than baking the pie. If there is a case where I do need to create dessert, the simpler the better. This is why I am seriously obsessed with slab pies. They are nothing fancy. You can use a store-bought crust(s), and you can put them together in just a matter of minutes. This amaretto mixed berry deep dish slab pie is one of my most recent obsessions. It is so flavorful and so comforting. 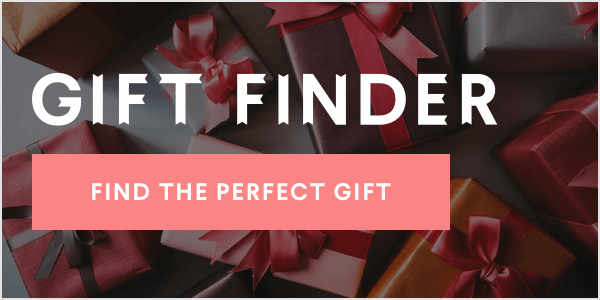 It is the perfect accompaniment to your Thanksgiving spreads, and here are some pairings that I just love to serve with it. Beer Barleywine-style beers are one of my favorites for the fall and winter seasons. There is something just so warming and comforting about them, and when I do pair with them, I tend to pair them with a dessert or something that has been flavored with a liqueur. I love a barleywine as a pairing for this slab pie purely based on the fact that there is amaretto involved. It really is the perfect pairing, so don't forget to pick up a barleywine when you decide to make this pie! Thanksgiving I could go on and on about all of the amazing recipes to have on your Thanksgiving menu, but I'm going to keep it quite simple. If you are looking for some great side dishes for turkey day, I posted a roundup not too long ago, that contains all of my favorite Thanksgiving side dish recipes. All of these recipes can be found on Cooking and Beer, and I stand by each and every one of them. When you go to choose how you will prepare your turkey, I posted a recipe for maple bourbon tamarind roast Thanksgiving turkey just a couple of days ago. This turkey recipe is one of my favorite turkey recipes yet. It is so packed full of flavor and will be the perfect addition to your Thanksgiving menus! Preheat your oven to 400 degrees F and lightly spray a 9x13in baking dish with a nonstick spray. Set aside. Flour a work surface and take two of the pie crusts out of their packaging. Place one on top of another and lightly flour the top. Roll the crust out to a 16inx12in rectangle. Place the crust into the prepared baking dish, pressing down in the corners. Leave the edges as is. You will deal with those later. In a large bowl, combine the berries, flour, brown sugar, granulated sugar, cornstarch, amaretto liqueur, cinnamon, and lemon juice. Very gently toss the ingredients together and pour into the prepared crust. Again, flour a work surface. Take the two remaining pie crusts and unroll them. Place one on top of the other and light flour the top. Roll the crust out to another 16inx12in rectangle. 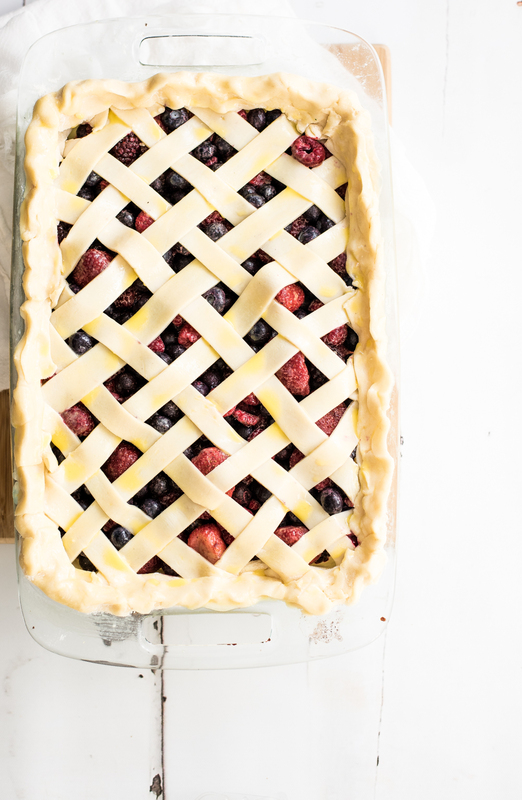 Cut 1/2 inch strips (long) from the dough and begin layering them on top of the berries to form a lattice. To do this, place half of the strips diagonally across the pie. Weave in the remaining strips to create a lattice. Trim the edges so that they are even with the bottom crust, and then pinch the sides of the crust. Brush the pie with the beaten egg. This will help to darken the crust as it bakes. 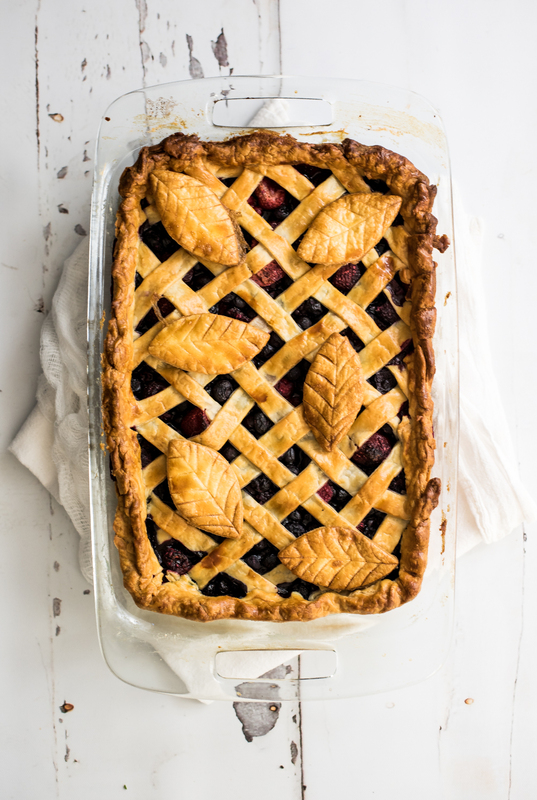 Bake the pie for 50 minutes to an hour or until the berries are bubbly and the crust is dark brown. Remove from heat and allow the pie to cool completely before slicing and serving. Enjoy! OPTIONAL: You may create the a design with your crust if you wish. 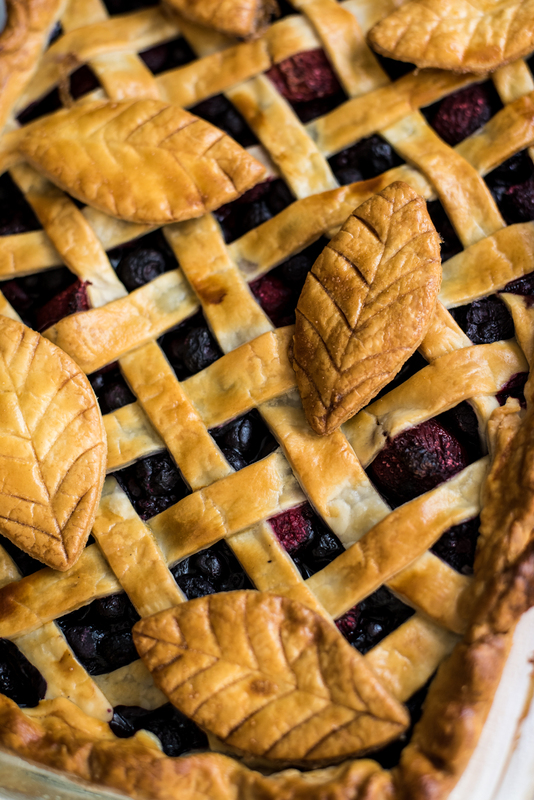 In order to create the leaves, I used a small cookie cutter and baked the leaves separately from the pie. They should only take a few minutes in a hot oven to brown on their own. The post Amaretto Mixed Berry Deep Dish Slab Pie first appeared on Cooking and Beer.